The Story of Creative Capital (1957), courtesy the Hagley Museum & Library. To celebrate the 100th anniversary of the Technicolor Motion Picture Company, the developers of the color process that vividly brought the palette of the world to movie screens, the NFPF is pleased to present two short sponsored films made using the innovative technique. The Story of Creative Capital (1957) is an animated lark from John Sutherland Productions made in cooperation with E.I. du Pont de Nemours & Company and the Chamber of Commerce. A paean to the importance of business in American life, the film stresses the vital role of the individual investor to the capitalist system. With its jazzy color scheme and Les Baxter soundtrack, The Story of Creative Capital exemplifies the pop culture tendencies that drive many sponsored films. Mrs. Mortimer Jones Prepares “Dinner for Eight” (1934) was the second live-action short film to be released in three-strip Technicolor. Mrs. Mortimer Jones Prepares “Dinner for Eight” (1934), courtesy The Huntington Library, Art Collections, and Botanical Gardens. Produced for Southern California Edison by the Technicolor Corporation to tout the advantages of domestic electrical appliances, it was filmed by Academy Award–winning cinematographer and Technicolor master Ray Rennahan, who went on to shoot Becky Sharp, the first major motion picture filmed in three-strip Technicolor, and win Academy Awards for Color Cinematography for Gone with the Wind and Blood and Sand. 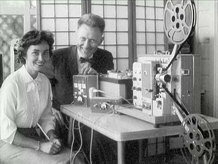 Natalie Kalmus, former wife of Herbert Kalmus, the Technicolor inventor, served as color supervisor. Riffing on the title of George Cukor’s Dinner at Eight, the short demonstrates how a kitchen operating with electrical appliances can save a busy homemaker time and allow for freedom from the drudgery of housework. The Dawn of Technicolor: 1915–1935 by James Layton and David Pierce, recently published by George Eastman House tells the story of the company’s formative years with lavish illustrations documenting the early cinematic triumphs of the process. To learn more about sponsored films and their role in American culture, check out the NFPF’s own The Field Guide to Sponsored Films by Rick Prelinger. It can be ordered or downloaded here.